Welcome to the Television Antennas History page. This page is designed to give you the basic outline of how the history of the Television Antennas came about. From being called aerial antenna, roof top antenna, hd antenna, TV antenna, UHF antenna, VHF antenna, VHF/UHF/FM antenna they all are for the same thing. Television Reception so we can watch clear TV. Long ago you still had to shop for an indoor or outdoor T.V. antenna, decide where and how to mount the antenna. Next is the cost and am I going to do-it-myself or find someone to do it for me. Just think about when TV or television first came on to the market. All that was out there for communication in the home was the radio. There wasn't even antennas needed before television. After television came the antenna market. People wanted their TV to have the best picture. Next came more channels which meant more directions for TV signal. That's when the rotor came into place to rotate the antenna system. Then to even make television better we put TV's in several rooms. To keep the picture quality good at all locations came amplification of the antenna system. Now we have hi def television with great picture quality and it is free tv. With hi def tv (hdtv or high definition television) you still need an antenna. All this just for television watching. Shop for your TV antenna, amplifier, rotor, or mounts at our on line store. Detailed information is available on all of our TV antenna products. Can we help you? For some interesting reading check this out HDTV Antenna Fact or Fiction! Some things have not changed. Outdoor antennas are required for the best television reception. If you live close enough to the television stations, an indoor antenna can be used. The most common type is the "rabbit ears" antenna. The names most commonly used for television reception are TV antenna, aerial, roof top antenna, or television antenna. So lets take a look at what these four words really mean. The act or process of receiving or of being received. Football. The act or an instance of catching a forward pass. A welcome, greeting, or acceptance: a friendly reception. A social function, especially one intended to provide a welcome or greeting: a wedding reception. Mental approval or acceptance: the reception of a new theory. Conversion of transmitted radio waves or electric signals into perceptible forms, such as sound or light, by means of antennas and electronic equipment. The condition or quality of the waves or signals so received. The transmission of dynamic or sometimes static images, generally with accompanying sound, via electric or electromagnetic signals. An electronic apparatus that receives such signals, reproducing the images on a screen, and typically reproducing accompanying sound signals on speakers. The visual and audio content of such signals. The industry of producing and broadcasting television programs. an·ten·na (?n-t?n'?) n., pl. -ten·nae (-t?n'?). Zoology. One of the paired, flexible, segmented sensory appendages on the head of an insect, myriapod, or crustacean functioning primarily as an organ of touch. Something likened to this sensory appendage, as in function or form: sensitive public relations antennae. pl. -nas. A metallic apparatus for sending or receiving electromagnetic waves. Of, in, or caused by the air. Existing or living in the air. Reaching high into the air; lofty. Suggestive of air, as in lightness; airy. Of, for, or by means of aircraft: aerial photography. Botany. Growing or borne above the ground or water: aerial roots. 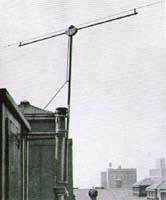 A radio antenna, especially one suspended in or extending into the air. By the late 1980s, 98% of all homes in the U.S. had at least one TV set. On average, Americans watch four hours of television per day. An estimated two-thirds of Americans got most of their news about the world from TV, and nearly half got all of their news from TV. These figures are now estimated to be significantly higher. Practically every country in the world now has developed at least one television channel. Television has grown up all over the world, enabling every country to share aspects of their culture and society with others. Indoor or Outdoor television antennas, people have been installing for themselves (do-it-yourself) for years. The development in TV antennas designed today is the greatest. From omni directional (round rotor free antenna), to amplified rotating conventional antennas (vhf & UHF) people can view channels from all around them. I believe that HDTV is the future of television. Network channels are going to become the most popular watched channels on television. Free TV is going to give cable TV and satellite TV a run for their money. We have tried to make it easy for the people to get the facts about HDTV. We have set up pages of the best information on the web for you to view. Along with a channel finder to locate every network in the United States. It’s all set up for you. Free information, free phone call or email a question. We are here to help the do-it-yourself installer. If you can put up an antenna once and get awesome picture quality why pay monthly? The most convenient, least expensive, easy to install, HD-VHF-UHF TV antenna is the MS-2000 (the round antenna) by Winegard. This television antenna picks up stations in all directions without a rotor and it's also amplified. It can be used just about anywhere. We helped bring that antenna to the market years ago. The original antennas we sold are still out there working today. Now on the other hand the ultimate television antenna system to have is the Winegard HD-7084 TV antenna with an amplifier and a rotor, mounted above your roof line (for best reception). If a channel can be gotten from your location this system will get it. Before the war, television stations had limited transmitter power, and receivers had poor sensitivity, so an antenna was almost a necessity. On your left are some of the antennas used before World War Two. Today television stations have a great out put power and you can receive signals from several directions at a time. We have the conveniences of choosing the size, style, and shape of a television antenna that you prefer for your home. On your right are some modern television antennas. Click on a picture to view a larger image! After the war, stations were broadcasting with higher power, but until the mid 50s there were still many areas of the country that had poor television service. Large outdoor antennas were needed. Here are a few of early antennas from the late 40s, when channel one was still used. Motorless Antenna from the 50's and 60's. Now we call these kind of television antennas omni directional or rotor free. The rotorless idea then carried through to today. It has advanced in technology just like the rest of the UHF/VHF/HD television antennas have. "Pictures courtesy of the Early Television Museum"
These links will take you to other information about the history of early television.